A plate reactor where chemical reactions occur throughout and reacting chemicals are introduced at two points in the reactor. Optimizing chemical reactors, filtration equipment, mixers, and other processes is made easy with the Chemical Reaction Engineering Module. It contains the tools for you to simulate material transport and heat transfer together with arbitrary chemical kinetics in all types of environments - gases, liquids, porous media, on surfaces, and within solid phases - or combinations of all of these. This makes it perfect for all facets of the chemical and process industries, and even within environmental engineering where the "process unit" or "chemical reactor" is the environment surrounding you. The Chemical Reaction Engineering Module contains intuitive user interfaces for you to define material transport in dilute and concentrated solutions or mixtures through convection, diffusion, and ionic migration of an arbitrary number of chemical species. These are easily connected to definitions of reversible, irreversible, and equilibrium reaction kinetics that can be described by the Arrhenius equation, or any arbitrary rate law, where the effects of concentration and temperature on the kinetics can be included. The interface for defining chemical reactions is straightforward as chemical formulas and equations are entered essentially as you would write them on paper. COMSOL sets up the appropriate reaction expressions using the mass action law, which you can alter or override as you desire. The stoichiometry in your reaction formulas is used to automatically define mass and energy balances, either for homogeneous or heterogeneous reactor conditions; in bulk or on surfaces. 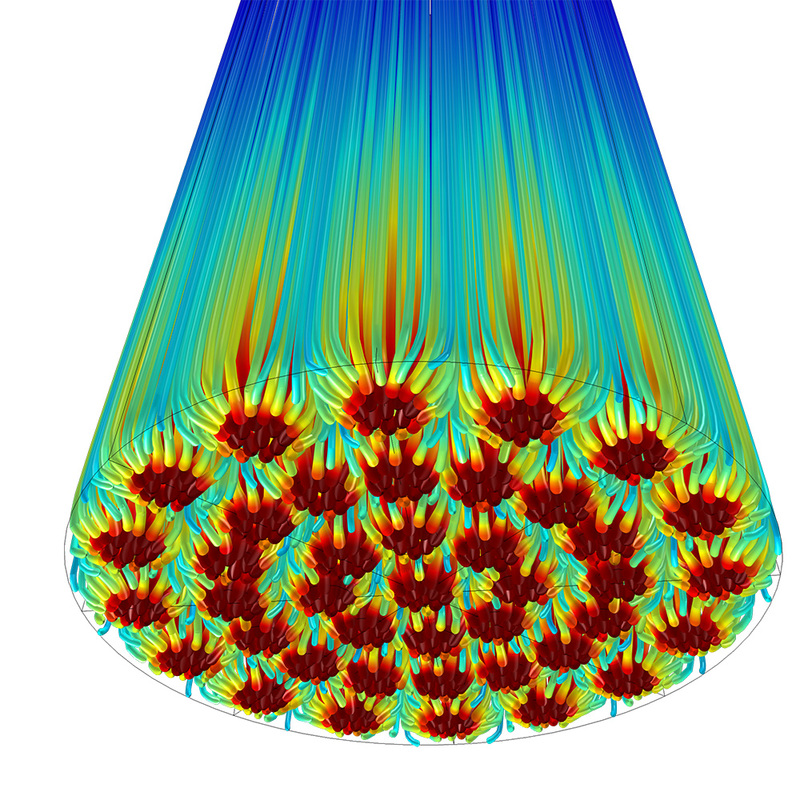 Round Jet Burner: Simulation of turbulent combustion in a round jet burner. Results show the temperature and CO2 mass fraction in the reacting jet. 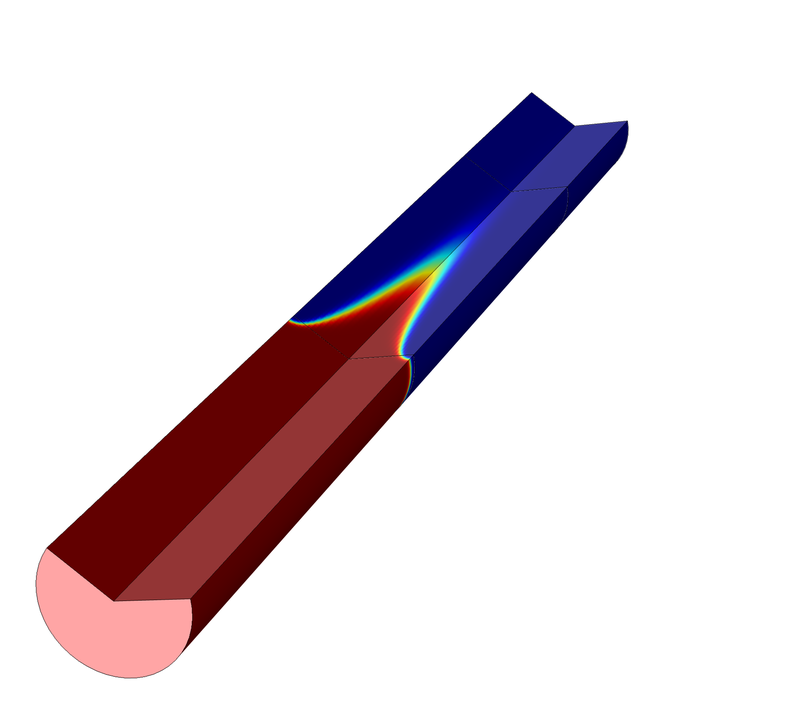 Biosensor Flow Cell: Simulation of a flow cell containing micropillars coated with an active material to support the adsorption of an analyte. Results show velocity streamlines and the concentration distribution of the adsorbed species. 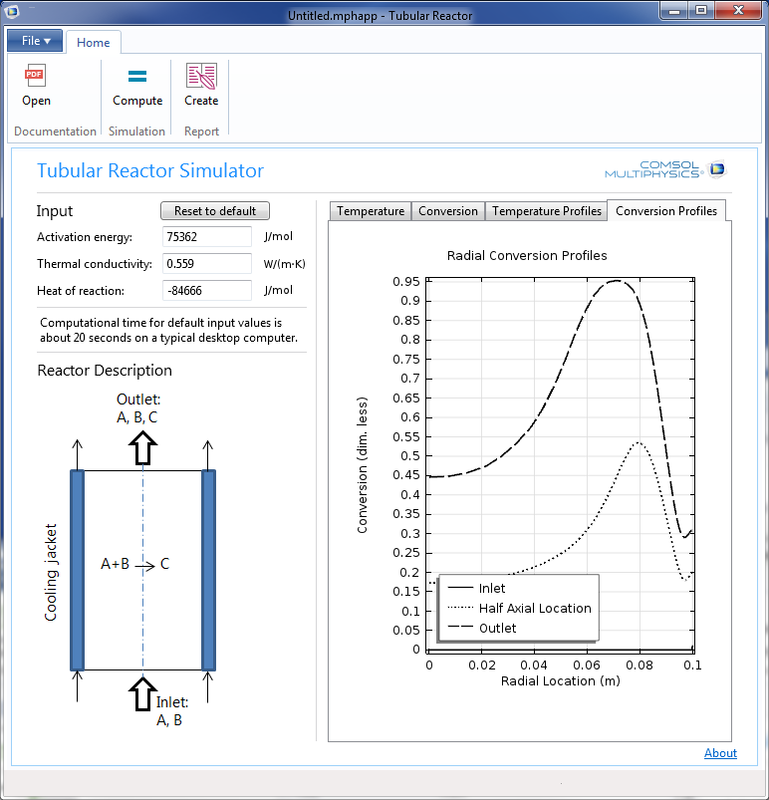 Tubular Reactor Simulator: This is an app that simulates a tubular gas reactor, chemical reactions take place in a stream of gas that carries reactants from the inlet to the outlet. Mass and energy transport occur through a convection-diffusion and convection-conduction processes. Water Purification by Silver Complexation: Many industrial processes leave remainders of toxic dissolved metal ions in process flows. This model example shows a purification reactor where silver ions are complexated to diamine-silver for removal. Packed Bed Reactor: This model calculates the concentration distribution of the reactor gas that flows around catalytic pellets, by also using an extra dimension to model its concentration distribution inside each of the porous catalytic pellets. Shown are the velocity streamlines at the bottom part of the reactor, where the color plot indicates the concentration. Tools for calculating thermodynamics properties, including from external sources, are included in the Chemical Reaction Engineering Module so as to augment the coupling of heat transport and enthalpy balances to your material transport and chemical reactions. User interfaces for defining momentum transport are also available for you to consider the complete description of your process' transport phenomena. This includes laminar and porous media flow described by the Navier-Stokes equation, Darcy's Law, and the Brinkman Equations. 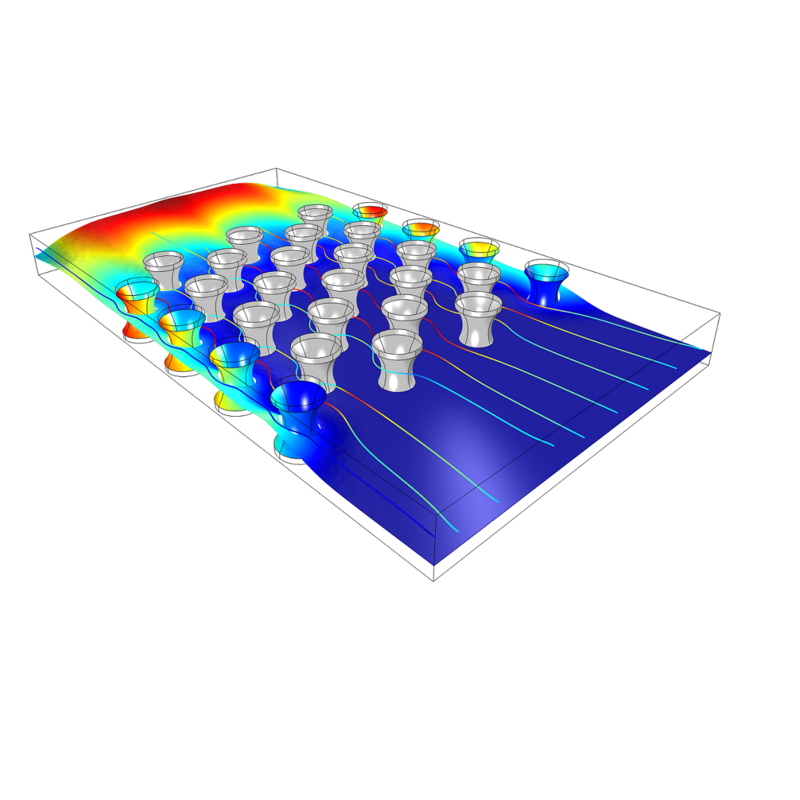 By coupling the CFD Module or Heat Transfer Module to your modeling, you are also able to incorporate turbulent flow, multiphase flow, and nonisothermal flow, as well as radiation heat transfer. These are all supplied with appropriate definitions for constant or varying masses or volumes, as well as isothermal, nonisothermal and adiabatic conditions. Perfect for incorporating your optimized kinetics in a process environment, these simple models allow for increased understanding of your system, and let you simulate a myriad of different operating conditions. With all the knowledge you gain from this, your next step is to optimize your unit's design and fine-tune your operating conditions through a full 2D axisymmetric or 3D model. The Generate Space-Dependent Model feature can be used to fully incorporate your system's mass and energy balances together with fluid flow and chemical rate of reactions. Automatic ideal reactor models with generation of kinetic expressions based on chemical formulas. The application of modeling to chemical engineering is a cost-efficient way to explore new designs of systems and processes. COMSOL has been developing its capabilities with the chemical processes and engineering for over 10 years now. By using modeling, the engineer can achieve the understanding and intuition required for further innovation, and increase efficiency. A main feature of COMSOL is the symbolic and interpreted interfaces that allows you to define whatever you like, such as chemical and electrochemical reactions, or kinetic, thermodynamic, or transport expressions. 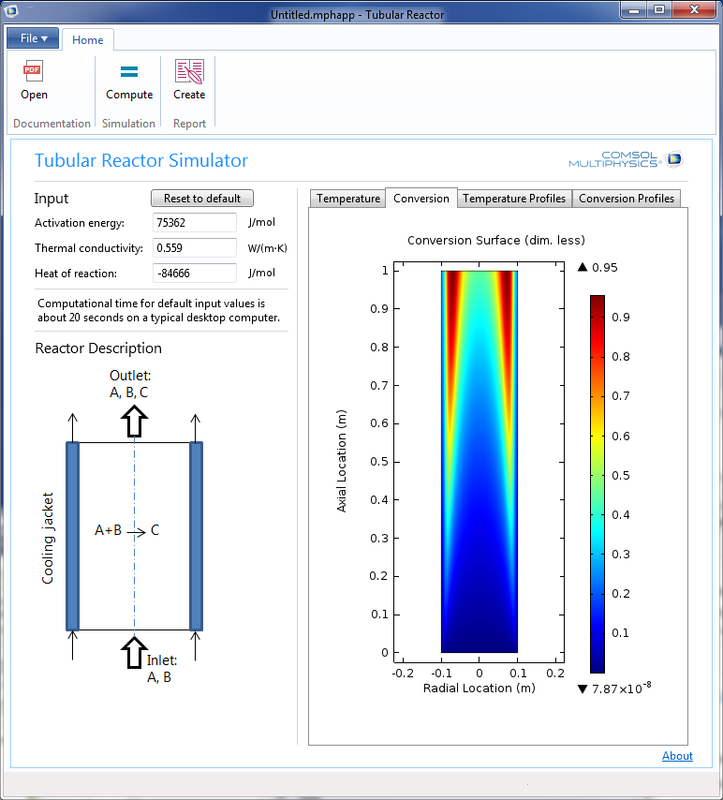 In this tutorial, the heat and mass transport equations are coupled to laminar flow in order to model exothermic reactions in a parallel plate reactor. It exemplifies how you can use COMSOL Multiphysics to systematically set up and solve increasingly sophisticated models using predefined physics interfaces.